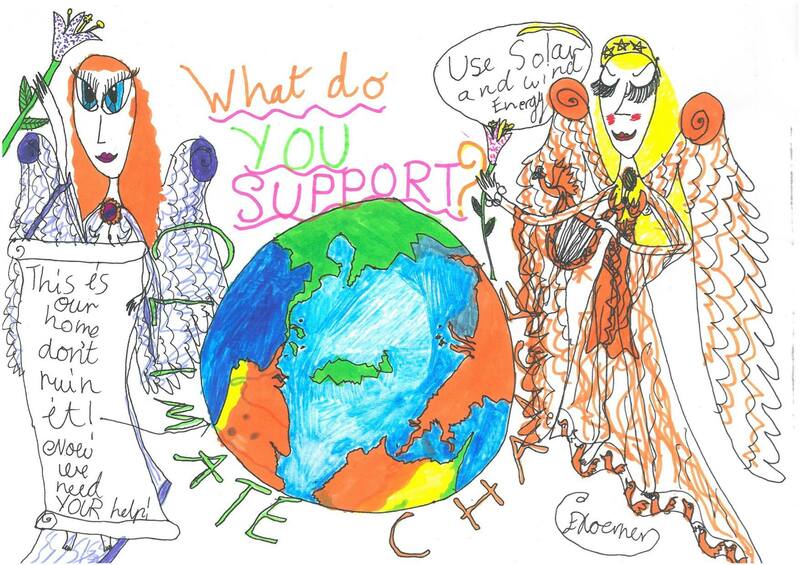 At a series of readings and installations around central Paris during COP21 (30 November – 11 December), Climate Guardian Angels will present letters and artworks created by Australian children and teenagers to the public. The letters implore international leaders to secure their future by urgently transitioning global energy systems away from dirty and dangerous fossil fuels towards zero pollution, renewable energy sources. 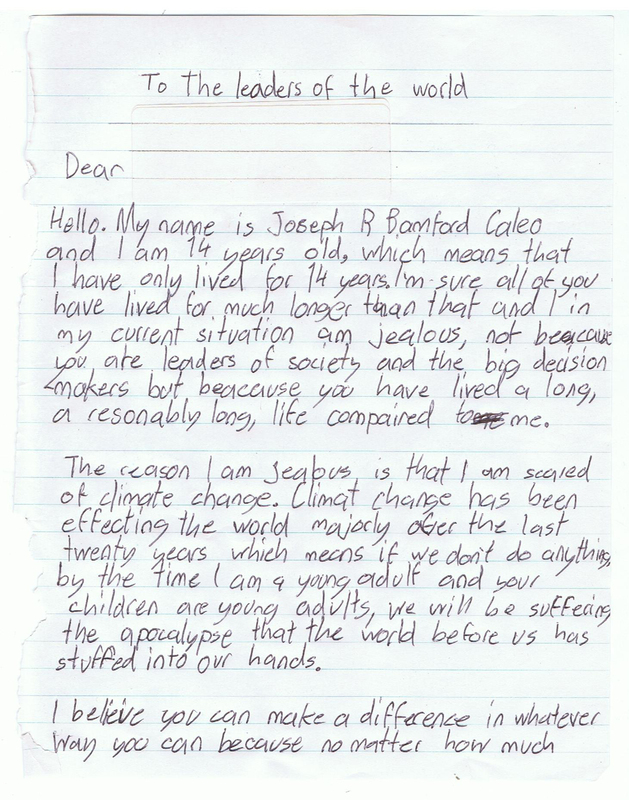 This moving letter written by Joseph (age 14, one of the Angel’s sons), helped inspire our mission. 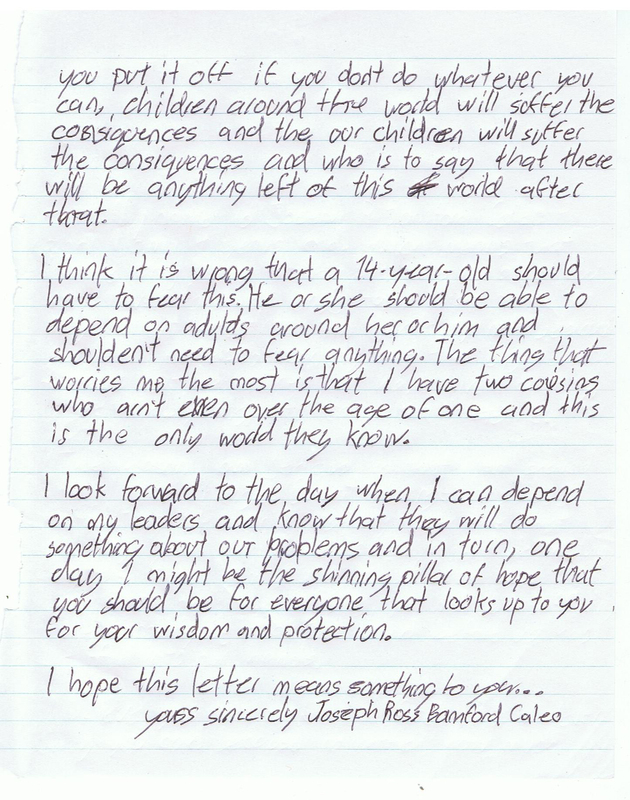 Hundreds of letters of were sent to the Climate Guardians from children and teenagers all around Australia. They are profoundly moving and deeply galvanizing. Australian delegates to the COP21 talks must carry the voices of these children into these talks and represent their pleas for a just and safe climate. They can all be read here. The COP21 meeting of heads of state on climate has been described as ‘the most important diplomatic gathering ever’ and ‘a last chance for humanity’. None will bear the consequences of a failed agreement to decisively on climate more than future generations, yet the voices of children will not be heard. It deeply disturbs us that the fears and hopes of Australian children have been particularly dismissed by their representatives in COP21. In Australia fossil fuel corporation lobbyists have distorted our democratic systems to the extent that when the checks and balances in our courts reject a project that will dangerously increase carbon emissions, these laws are simply changed. Australia is the first country to repeal a price on carbon. The research bodies and regulatory institutions studying and informing the public on climate science have been gutted. All to support a business model that is rapidly and irreversibly destroying the world’s natural assets, within and far beyond our shores. Understanding the seriousness of climate findings, as well as the fully feasible and affordable solutions to address its grave threats, the Climate Guardians have conceived COP21 demands – read in English or French – to drastically reduce greenhouse gas pollution as well as address gross and worsening inequity. No longer can the unravelling of UN climate negotiations be used as an excuse for ‘business as usual’. Please don’t hesitate to get in touch with any queries. ClimActs is an Australian protest theatre troupe using striking spectacle as well as satire to communicate the urgency of climate change. 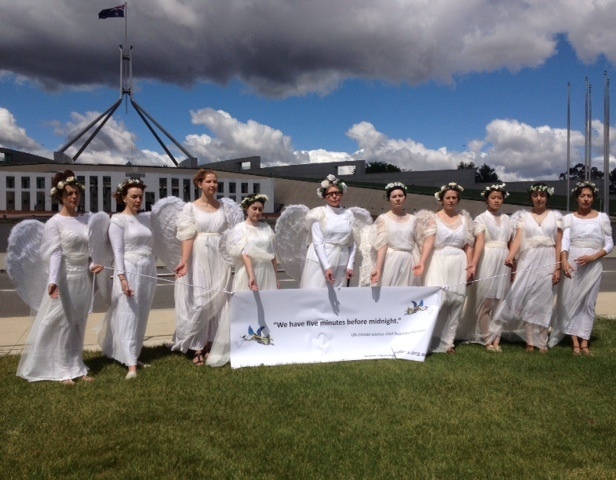 Our founding act is the Climate Guardians, who use guardian angel imagery to portend the dangers of government inaction on climate change as its threats continue to mount. For over two years we’ve been appearing at rallies, backdropping or intercepting politicians, and protesting at fossil fuel headquarters to demand climate justice. Last year the Climate Guardians officially opened the acclaimed Lorne Sculpture Biennale with a Coal Requiem performance. Now we are taking our act to the global stage. At the end of November we are travelling to Paris for the United Nations Conference on Climate Change (COP21). As Australian artists with a strong local following, the Climate Guardians will be performing to express the deep frustration of millions of our compatriots, stating unequivocally to the world that our Government’s unjust stance on climate action does not represent the Australian people. In fact more than seventy per cent of Australians want our Government to take effective climate action while around ninety per cent of Australians support renewable energy solutions to drastically reduce greenhouse gas pollution. We regard our Government’s failure to act on the warnings of climate scientists as a wilful dereliction of its fundamental duty of care to its citizens. It is unconscionable that the world’s most underprivileged people, and future generations, who will have contributed the least to the climate crisis will suffer the greatest should it be left to collapse. Measured on a per capita basis, Australia is one of the world’s largest greenhouse gas emitters. The current Australian Federal Government continues to ignore the science on climate and refuses to take responsibility for the nation’s disproportionately high per capita emissions as it charges ahead with plans to massively expand coal and gas (LNG) exports. We feel deeply ashamed that our Government continues to ignore Australia’s disproportionate contribution to the climate crisis, while ignoring those worst affected and least responsible. For further information about our performance plans in Paris during COP21, please visit our Précis in English or French.